So, what, you think you're better than Batman? The Caped Crusader's out there protecting an entire city without packing heat but you can't defend your little abode without a gun? For shame! Here are four methods for protecting you and yours without exercising the Second Amendment. The least dangerous way to protect your belongings is to hire someone else to watch your stuff while you're away. There are conventional monitoring firms like ADT that will perform the necessary equipment installations and system monitoring for a monthly fee. You could also install a self-monitored system like an Iris or Nexia. These systems are great for knowing what is going on within your home, just not very good at actually stopping it. Does Connected Home Security Actually Make Us Safer? Since you won't have firearms as a deterrent, you'll need to make your home as unappealing a target for criminals as possible. Install exterior flood lights if feasible, especially over secluded rear doors and windows, which should be kept locked as a matter of habit. 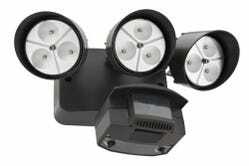 LED-based flood lights are quickly becoming the norm and will last for decades. Set them on a motion sensor if you find the soft glow of security too distracting at night. While flood lights will make most burglars skitter off like cockroaches, they aren't deterrent enough for more determined robbers. You'll need some sort of physical barrier as well. Like a moat! 10 feet wide, 15 feet deep, crocodiles and draw-bridges, the whole shebang. Of course if that isn't feasible—either due to finicky a HOA association or the fact that your apartment is on the fifth floor—rose bushes make for a formidable alternative when planted under windows and along fencing. Few stereos are worth a face full of brambles. With a sense of smell 100,000 times more sensitive and hearing range four times that of a human's, not to mention superior low-light visibility, dogs make for wonderful intruder early warning systems. And even if you opt for something as small and unintimidating as a Bichon Frisse, its high-pitched yipping will easily rouse even the deepest sleeper and ward off all but the most determined burglars. If your doggie alarm goes off in the middle of the night and it's not a false alarm, first, call 911. Then, if you feel you must, arm yourself with something blunt, heavy, and easily swing-able in preparation for the defense of your immediate area. Improvised weapons about the length and heft of a softball or cricket bat are good a good choice, able to inflict solid damage in a single strike but manageable enough to swing more than once. You should avoid excessively long or thin weapons like bo staves or kendo swords as they will inhibit your movements in the close quarters of your apartment, for example. Edged weapons like machetes, kitchen knives, and katana are also a definite no-go unless you've had formal training. 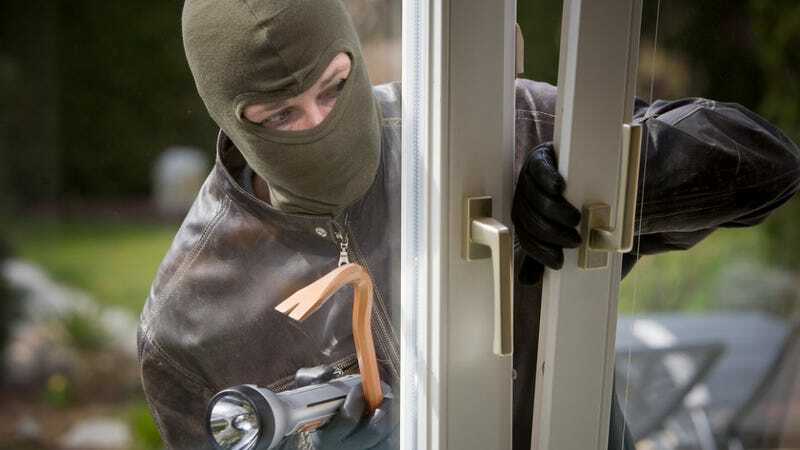 If going toe-to-toe with a potentially drug-crazed home invader while armed with little more than a large stick and some adrenaline doesn't seem like a situation likely to work out in your favor, ranged chemical weapons like pepper spray, mace, or bear repellent can help you even the odds. Pepper and bear sprays use Oleoresin Capsicum, the chemical that gives peppers their burn, as an incapacitating agent with OC constituting up to 18 percent or more of the formula. These sprays are delivered either as an aerosol stream or a lathery foam. While aerosol may travel farther, these streams are more prone to misting than foam types, which could backfire on the user. In a severe pinch, fire extinguishers can be used as defensive weapons as well. But be warned, a blast to the eyes can and often does cause permanent blindness. And no, booby traps are not a valid option for home defense. Period. You are not Kevin McCallister so don't even ask.